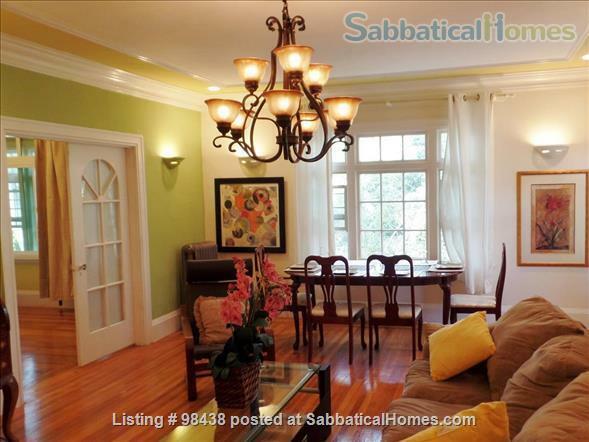 This renovated and artistically-decorated 2-bedroom 1-bath apartment is located in the delightful and desirable “Near Northside” neighborhood, 6-8 minutes’ walk from UC Berkeley. 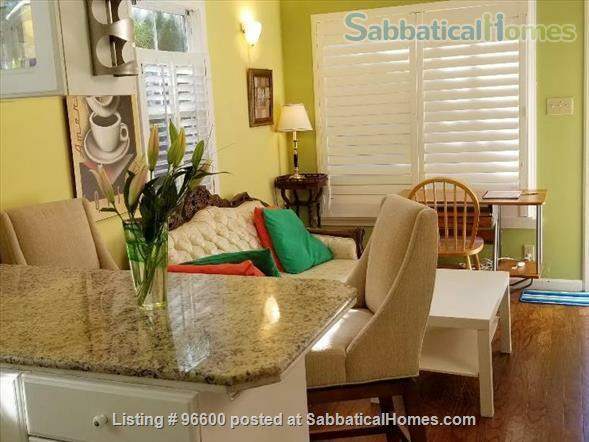 •	It is small, fully furnished and equipped, and artistically decorated with a “cottage like” feel, in a quiet tree-lined neighborhood. •	Sleep under the redwood trees! There are 5 on the property. •	Suitable for a couple, 2 colleagues, or a small family. 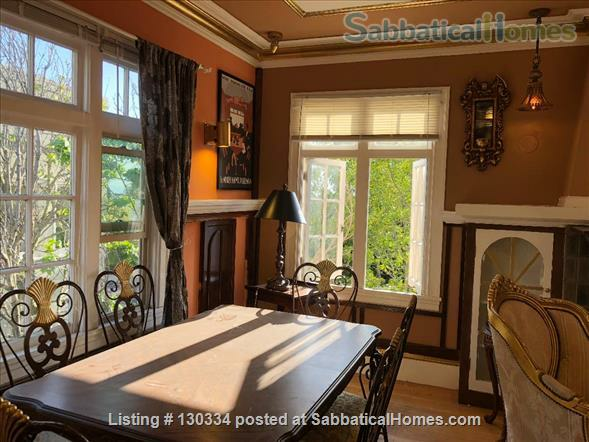 •	Comfortable living/dining room with hardwood floors and an old (non-working) ornate fireplace and mantel. •	2 bedrooms, each with a mirrored closet. We could remove the bed from one of the bedrooms if you wish to use it as an office. •	Fully equipped kitchen with dishwasher and small breakfast bar - rear entrance door leading to parking area. •	Bathroom with walk-in shower - 2 showerheads. 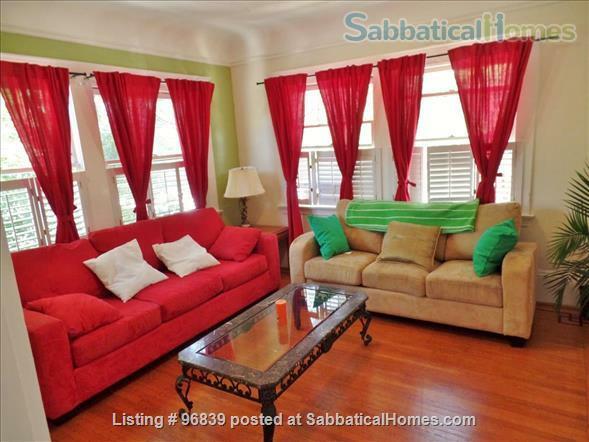 •	All utilities provided including cable TV and wi-fi. •	Laundry facilities at the rear of the building (a few steps from the back door). •	Virginia Street is quiet and peaceful - at the foot of “Holy Hill" with several seminary schools. •	It's a 6 minute walk to the UC campus - although longer if you prefer a leisurely-paced stroll along tree-lined streets or stop to pick up an espresso on the way! •	The adjacent townhome is occupied mainly by university-associated visitors. •	You are just one block from Euclid Avenue with a selection of stores, cafes, sandwich shops, a small grocery store, and coffee houses. •	10 minutes’ walk from Berkeley’s so-called “gourmet ghetto” with many fine and eclectic dining experiences including Alice Waters’ world-famous Chez Panisse and the Cheeseboard Pizza Collective. •	11-12 minutes’ walk to the Berkeley Rose Garden (where you can see spectacular sunsets over the SF Bay) and Codornices Park on Euclid Avenue. •	You can walk to downtown Berkeley and the BART station (Bay Area Rapid Transit system) in about 20 minutes. There is bus service a few blocks away. •	Twenty minutes driving will take you to San Francisco across the Bay Bridge (outside of rush hours! ), or it’s 20 minutes via BART. Driving to Marin County, Napa Valley and Lake Tahoe are also easy options. •	In addition to the quoted rent, we ask for a security deposit of half a month’s rent; that will be refunded at the end of your stay, assuming no damage claims. •	The rate is all-inclusive. We pay the Berkeley business license tax, but it is not charged to you. •	One off-street parking space is available for you at the rear of the building. •	No smoking anywhere in the building or the grounds! A Berkeley City ordinance prohibits it in multi-family buildings and common areas. •	This is a quiet residential building in a serene neighborhood (beneath redwood trees) Please, no parties or loud noise! Printer can be provided on request. Berkeley, California. Originally from the UK, I have 2 (!!) graduate degrees from UC Berkeley - an internationally renowned university in a vibrant city – a community with innovative restaurants, serious coffee houses, arts and cultural events, intriguing architecture, and many parks for outdoor activities. It enjoys a mild Mediterranean climate – summers are cooler and winters are milder than most of the rest of the US. It’s across the Bay from San Francisco and is accessible by car across the Bay Bridge or San Mateo Bridge – by BART (Bay Area Rapid Transit) under the Bay – or by ferry at Jack London Square in Oakland. If you are looking for fully furnished accommodation within easy walking distance to the UC Berkeley campus, for your sabbatical, teaching or research assignment, please contact me for more information.